The New Mexico Scientific Laboratory houses the New Mexico state public health and environmental health testing laboratories of three state agencies: the Scientific Laboratory Division of the Department of Health, the Veterinary Diagnostic Service of the Department of Agriculture and the Office of the Medical Investigator. These laboratories are an essential component of the public health system in the state, sharing a common mission of protecting the health and welfare of the public and environment of New Mexico. The facility is staffed by approximately 200 scientists- pathologists, veterinarians, toxicologists, chemists, microbiologists, virologists- and support personnel. Specifically, these agencies provide scientific support to public agencies within New Mexico that are involved in the identification and control of infectious diseases and environmental threats of public health importance in humans, agricultural animals and wildlife, as well as the investigation of death in humans and animals. The services provided by the Tri-Lab agencies serve the entire population of New Mexico, from ranchers and pet owners to hospitals and law enforcement, and include a large amount of technical training to hospital personnel, physicians and law enforcement personnel across the state. Elizabeth Busch, from Glenburn, Maine was selected to create the artwork. The artwork was installed in February 2012. Constructed of acyrlic painted and woven UV acetate, "Outside, Inside" incorporates abstract imagery that refers to the colors of the earth and sky of New Mexico, the Rio Grande and the Sandia mountains. 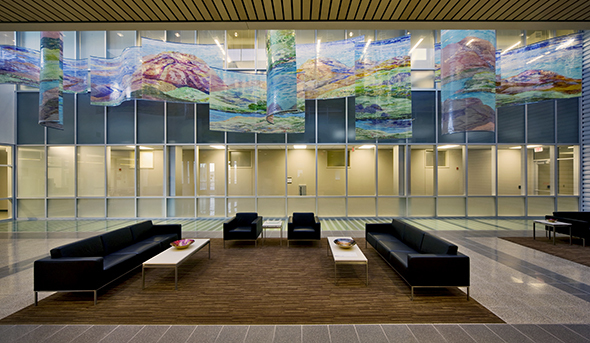 Busch's group of eleven suspended panels eliven the lobby of New Mexico Scientific Laboratories. At first glance, visitors and employees of the facility are drawn to the colorful, undulating landscape overhead. Upon closer inspection the viewer sees image fragments of microscopic cells that are hidden within the composition, thus creating the dichotomy between the "outside" and "inside" landscapes.